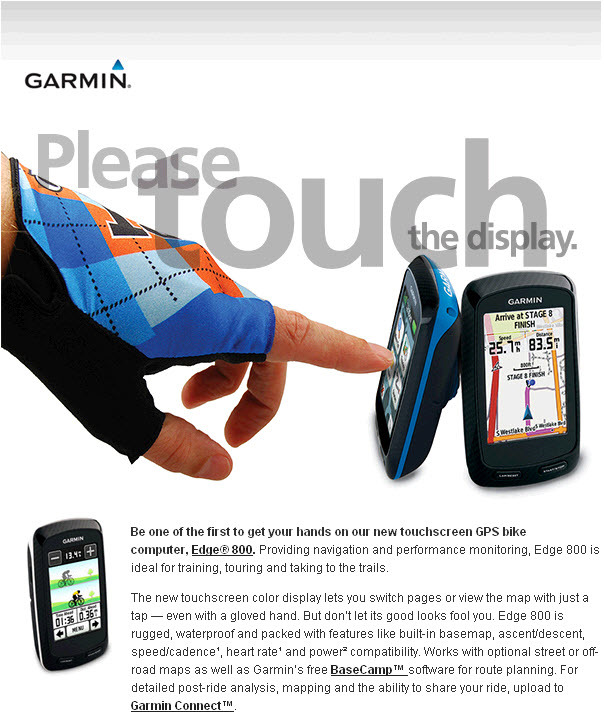 Cyclesnack: Garmin Edge 800 - The Touch! Now this is cool! A touch screen Garmin Edge! Suggested retail is $499. Looks like it utilizes the Edge 500 mounting bracket, so that is barrier of ownership right there for me as I have the 705 bracket mount on all five bikes right now. Also, when you think about it, this is really geared towards roadies because most mountain bikers where gloves that are not fingerless. All Garmin needs to add is a few downloadable apps and some cell phone capability and they will be able to directly compete with the Android and iPhone.